(Nanowerk News) The development and understanding of efficient catalysts based on isolated metal centers stabilized on suitable hosts is a challenging task that has sparked the imagination of researchers worldwide. The major interest in this topic arises for three key reasons: the prospect of improving the utilization of precious metals, the potential to achieve unprecedented functionality thereby enabling landmark shifts in catalytic processes, and the possibility to gain fundamental understanding of catalytic materials. 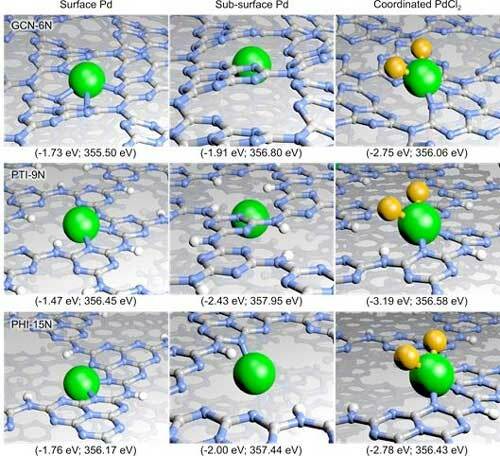 Prof. Javier Pérez-Ramírez's team together with other collaborators made radical progress in the topic, identifying the unique potential of graphitic carbon nitride as a host for palladium atoms in 2015. Since then, they and other groups have broadened the scope of these crystalline polymeric materials to other metals (platinum, iridium, gold, silver, to name a few), devising novel routes for their introduction, and demonstrating the efficacy of the resulting materials in further applications. Carbon nitrides exhibit a rich structural diversity and can exist in different crystalline forms, which present unique coordination sites for single atoms. Nonetheless, all previous studies focused on the most common graphitic carbon nitride structure based on two dimensional polyheptazine layers. Although this structure can bind metals strongly due to the intrinsic presence of cavities integrating 6 nitrogen coordination sites, varying the architecture of the scaffold could generate new opportunities in the design of single-atom catalysts. In the present work (National Science Review, "Single-Atom Heterogeneous Catalysts based on Distinct Carbon Nitride Scaffolds "), the authors demonstrate that isolated palladium single atoms can be effectively stabilized on a series of carbon nitride scaffolds with distinct lattice structure. In particular, these included linear melem oligomers where the metal can be accommodated between the one dimensional heptazine chains, and poly(triazine imides) and poly(heptazine imides). The latter also comprise layered materials, but feature larger cavity sizes (containing 9 and 15 nitrogen atoms, respectively) than the original graphitic carbon nitride structure and contain exchangeable cations. Varying the lattice structure was found significantly impact the strength of the metal-host interaction, and thus the oxidation state of the palladium centers could be simply tuned through the scaffold selection. Despite comparable metal contents, significantly different catalytic activity was observed in the selective hydrogenation of 2 methyl-3-butyn-2-ol, an important reaction in the manufacture of fine chemicals, where the palladium atoms on linear melem oligomers and polymeric carbon nitrides are more active than the polyimides. An inverse correlation is observed between the rate of 2-methyl-3-buten-2-ol formation and the average oxidation state of palladium, highlighting the critical role of tuning the electronic properties of the host structure in tailoring the strength its interaction with metals. The robustness of these single-atom catalysts was verified by the unvarying performance with time on stream. Importantly, the selectivity towards the desired 2-methyl-3-buten-2-ol product approached 100% over all of the investigated single-atom catalysts, whereas the conventional (Lindlar) catalyst used for this type of reaction in industry, exhibited significantly reduced selectivity due to over-hydrogenation, thus reaffirming the high chemoselectivity of isolated palladium centers. The new mechanistic insights into the influence of the carbon nitride structure on metal stabilization deliver improved guidelines for the design of effective single-atom catalysts.